During our Christmas trip to the Disneyland Resort at the end of December, we were able to experience the soft-opening of the Frozen Fun Celebration at Disney California Adventure, scheduled to officially open January 7th, 2015. I have had so many friends call, email, message and text me asking how they can see Anna, Elsa & Olaf - plus still enjoy all the other fun the parks have to offer. 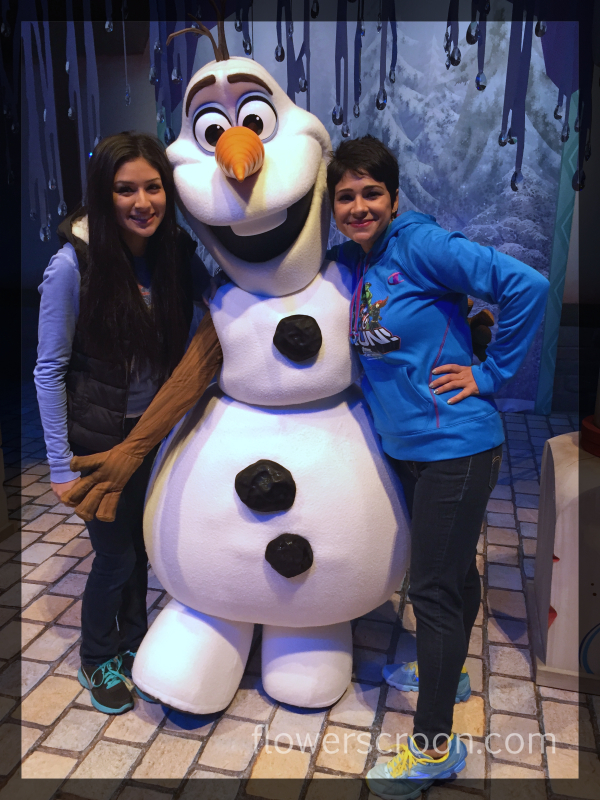 So, after answering 10+ emails I decided to write a post with all of my #FrozenFun tips. Waking up early is the key. We arrived at Disney California Adventure when the park opened at 8:00am, and went straight into Hollywood land. While the kids shopped for crazy hats to keep their heads warm, I walked towards the outside of the Animation Academy where I was able to get 4 virtual standby return time tickets for "Anna and Elsa's Royal Welcome". This FASTPASS does NOT interfere with attraction FASTPASSES - so go grab your Radiator Springs Racers FASTPASSES right after you get these! In the hour leading up to our 9:10am return time, we visited Olaf at Olaf's Snow Fest (more on that below), rode Tower of Terror, stopped for photos with The Incredibles and got 4 FASTPASSES for Radiator Springs Racers (a must-do if you want to enjoy this awesome attraction). At 9:00am my daughter and I entered the Animation Academy and enjoyed watching movie clips until it was our turn to line-up. While you're at the park, I recommend you visit the Royal Academy inside the Animation Academy. There is an artist on hand at various times throughout the day to teach you how to sketch characters like Olaf and Marshmallow. Check the schedule posted in the Animation Academy for times and characters. The entire process took a total of 15 minutes. I really recommend this as the way to go when it comes to meeting Anna and Elsa, especially for those with little ones. Disney did a great job with this queue. I would have never waited in the line to see them when they were in Fantasyland at Disneyland - so this really worked for us. 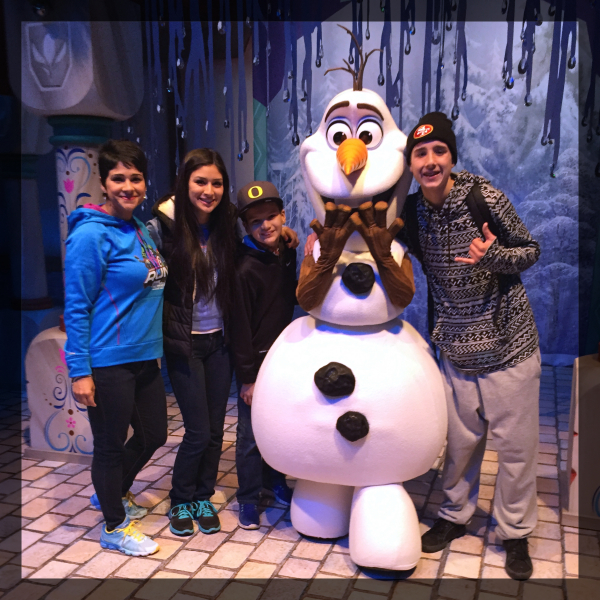 Before we met Anna and Elsa, we stopped at Olaf's Snow Fest to meet Olaf and play in the snow. Yes, REAL snow! Located at Stage 17 in Hollywood Land (beside Monsters Inc., Mike & Sulley to the Rescue), you will walk into a super cool winter wonderland that has everything from a giant snow slide, to performances by The Frolicking Fjords and The Tubadorsto, and food and souvenirs. Although there are 2 separate queues - one for the snow play and one to meet Olaf - there really wasn't much of a wait. The boys went straight to the snow! They raced down the snow slide and built a snowman while my daughter and I waited about 10 minutes to meet Olaf. Keep in mind, wait times grow as the day continues, with lines sometimes outside the door, and there are no FASTPASS options. It never hurts to also ask Cast Members for their take on when the best times are to visit. I loved the snow fest area. Cold weather is my favorite, and I really hope this will be here for me in the summer. Every so often, if you look up, you'll see snow falling from the sky. If that's not enough "Frozen" for you, just outside of Olaf's Snow Fest is Wandering Oaken's Trading Post. This is where you go when you to buy all the "Frozen". and clothes and accessories for adults. This is pretty much the in-park epicenter of all "Frozen" merchandise. 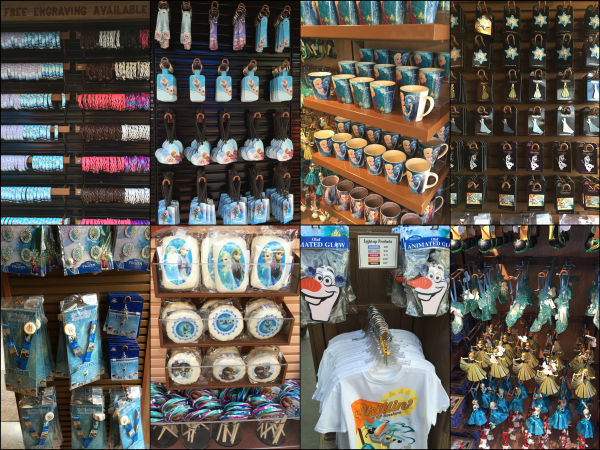 Everything from engravable leather goods and mugs to pins, snacks, a glowing Olaf and ornaments. In-between Olaf's Snow Fest and Wandering Oaken's Trading Post you'll find the Muppet*Vision 3D theater, which is now the Crown Jewel Theatre. It's the home of "For the First Time in Forever - A Frozen Sing-Along Celebration". If you want to see Anna, Elsa and Kristoff - but don't want to stand in line for a character close-up - this is the event for you. They, along with Arendelle Historians, perform a really cute show complete with some super fun moments from the movie "Frozen." You can catch this show by either waiting in line and walking in or by getting a FASTPASS. There was never a long wait while I was there, therefore we did not use FASTPASS. Also taking place in this area of the park every evening is “Freeze the Night! A Family Dance Party”. This family-fun dance party features really spectacular light effects and sweet treats for everyone. The gist of the party being that the temperature continues to drop all night until it eventually reaches the "freezing" point...that's when the letting it go happens. Disneyland: The Royal Theatre’s storytellers retell the tale of “Frozen” in their crazy, silly fast-paced way. Also, Anna and Elsa will be appearing pre-parade on their own float again during “Mickey’s Soundsational Parade”. Finally, the village of Arendelle has been added to one of my faovirte attractions, Storybook Land Canal Boats. It looks really nice! Downtown Disney: Olaf’s Frozen Ice Rink is continuing through February 22, 2015) and of course, Anna & Elsa’s Boutique isn't going anywhere. There you have it! We were completely finished with that area of the park fairly quickly and were able to head into Cars Land and enjoy the fun there. Waking up early, having one person run to collect FASTPASSES and a little pre-planning is all it takes. Please, as usual, feel free to hit me up if you have any questions or could use some help navigating the parks.